Running full speed in the wrong direction.. It's safe to say that Sonic has seen better days. The lightning-fast blue blur of a Hedgehog hasn't been able to produce a memorable and satisfying title in years until the release of Sonic Mania earlier this year, a title, I might add, that was initially crafted by fans of the series rather than an in-house established development team. Whereas Sonic Mania was a love letter to the beginnings of the storied franchise, Sonic Forces is built around the framework of the more modern titles, and while not a generally bad experience, it is not in any way shape or form a satisfying Sonic adventure. When Sonic Forces was first announced, it was done so with the revelation that you would create your own Sonic-inspired character and this caused the fan forums; both through Sonic fan art and fan fiction, to go absolutely crazy. Those who lived within one or both of these groups suddenly had an outlet for their own created characters to exist within the official Sonic universe and this lead to an outpour of creative content flooding Deviant Art and various other fan art and fan fiction homes on the internet. While the creative tools to create these wonders of fandom is fairly substantial, their implementation is lacking as much of the game neglects them and focuses far more on modern Sonic and Classic Sonic, the latter who returns from Sonic Generations to join forces once again. While yes, this is first and foremost a Sonic the Hedgehog title, there are several of the 30+ levels that will not feature your created character and I thought to myself, then why do we have these characters at all? The setup for your created avatar is straight out of some poorly written fan fiction; Sonic is defeated at the hands of Eggman and only your newly crafted hero can save him. The remainder of the story plays out exactly as you expect as Sonic will rejoin the various forces around him and team-up with your hero to take down Eggman and the Phantom Ruby powered, Infinite. When Infinite starts playing around with reality, this causes Classic Sonic to work his way into this world and team-up alongside Tails for the majority of the game. While previous Sonic games have included a guest character here and there, Sonic Forces may very well feature every single Sonic character ever created, but thankfully, they only serve as parts to the story than anything gameplay related. Both the story and the dialogue is cringe at best and falls flat in every regard. Sonic, and nearly the entire cast, apart from some moments for Tails, Eggman, and Knuckles, features some absolutely horrid voice acting. There are several voices that you'll recognize here that either is just not suited for the character or tonally stands out in a bad way. So much of the dialogue is painful to not only listen to, but large chunks of the game repeats the whole "bonds of friendship" theme to the point where the word "friendship" could be used as a drinking game here. There are 30 main missions that have a boss battle or two sprinkled in with Bonus stages and Secret stages opening up as you progress. The main missions can range anywhere from 3-4 minutes long to 10-15 should you die, and you will die a lot, but I'll get into why a little bit later. Bonus stages seem almost pointless here as several of them can be completed in under a minute. My first Bonus stage took me 38.3 seconds and upon clearing it, I was in disbelief that it was actually over. I jumped back into the stage to make sure I explored every bit of it, but yeah, I had. There are also SOS stages, but frankly, these just felt like a lame attempt to make me revisit previous content for no real reason. While there are some levels that I would gladly go back and race through a second or third time, there were several where I was glad I never had to do them again. The story will see you swap from Sonic, Classic Sonic, and your created hero at various points during the adventure. Each level will be tailored to that hero as each character navigates their zones in different ways. 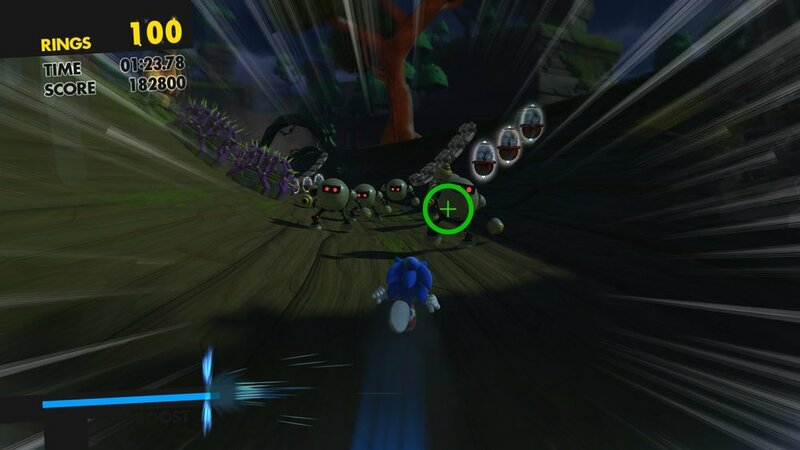 Classic Sonic can spin dash and bop enemies on the head, while Modern Sonic can lock on and dash directly into targeted foes, making for a far more faster-paced experience. You also have a boost that when used correctly, can almost see the game play itself when holding down the button. Your created hero has a grappling hook that allows him or her to latch onto floating orbs and swing around the levels while also having the same lock-on dash of Modern Sonic. There are also zones where you will team up with Sonic for a bit of tag team action. As you complete stages and have your results scored at the end, you will unlock new customization items for your avatar. You'll unlock hats, glasses, face masks, clothes, gloves, and boots. If you score an S ranking then you will see even more rewards unlocked. There are also special missions that unlock additional items should you complete them. The sheer amount of items is far greater in number than I had originally anticipated and thankfully, you earn rewards very very often. Should you want, you can also rent out other player avatars as well, letting you see what other players have created. 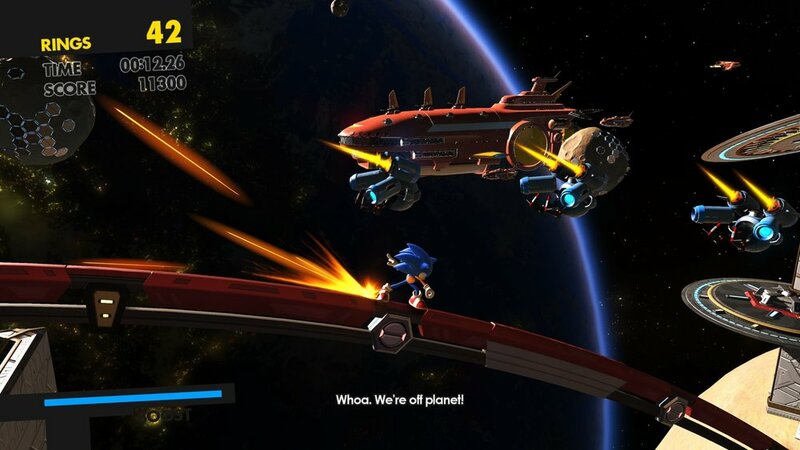 Apart from customizing the look and species of your hero, you can equip them with a sub-weapon called a Wispon. You can use it to bounce into the air, unleash a blast of fire, slam into the ground and freeze enemies in place, fire off electricity to shock enemies or fly through lines of rings. As you complete certain levels with a higher rank, you will unlock better versions of these weapons with better perks. These weapons are ok, but I only really enjoyed using a few of them. Once you have completed the main story, and even before you do, you can replay levels or attempt the Bonus and Secret stages to earn better ranks, or to go back and collect the red coins the game injects as the collectible in each zone. Collecting them all in a single pass can be rather difficult as some coins are only accessible through different paths in each zone. As is the case with generally most Sonic games, there are multiple paths to take in the majority of the levels here. There are some levels that are far more single-minded and these are the more lane-based and speed focused zones. The biggest problem with regards to its gameplay is when the game forces you to slow down and stop. Jumping from platform to platform is slow and rather easy to accidentally fall off ledges due to the floaty jumping physics and the speed at which your character can move. There is also a noticeable lack of a sudden stop when you attempt to make a jump and end up jumping just a bit too far. There is a reason why Nintendo takes so much into account with regards to how Mario can jump, the height of his jump and the feeling you have when it all comes together. I lost count of how many times I would fly off a ledge because there was no visual indicator that I needed to turn a certain way or jump at a certain time. There is also rail grinding that while fun, can suffer from rings blocking your view when the camera swings back to directly behind your character. There are also so many instant fail systems in place here that are so baffling that I wonder how these were even approved. There is one instance of electrified rails that just comes out of nowhere and a few other game mechanics that are only ever used once. Sonic Forces attempts to do far too much instead of simplifying the gameplay and focusing on fine-tuning what is there. The best Sonic games have never been about complexity and the focus on having so many systems here can cause the title to have somewhat of an identity crisis. The Boss encounters are somewhat enjoyable, but repeat way too much of their mechanics far too often. The Metal Sonic and following Infinite fight are literally the exact same battle and while we are trained to jump into the air and dash into enemies, the first battle requires you be on the ground to then be slammed into the air, a fact I found out only by accident after my 20+ attempts to jump in the air to attack him and become frustrated as why I wasn't able to lock-on to him. For all its faults, Sonic Forces is a gorgeous looking title that can in many ways look like a CG animated film. About the only issues I have with the game visually is that many elements of either your character or certain enemies can cause them to blend far too much into the backgrounds and make them very hard to see, like say placing light green robots in the Green Hill zone, which is you know, very green already. Character models are wonderfully animated and look really great. The variety you have with regards to your own character is equally as great and it boggles my mind why screenshot capturing during the story cutscenes are blocked on consoles. I wanted so much to take captures of my character interacting with Sonic that it was just bizarre why this was blocked. Most games do this to prevent story spoilers, but for a generic Sonic adventure? what is there to spoil? When Sonic Forces is focused on its speed and lane based gameplay, it succeeds as an enjoyable game. When it comes to a stop and attempts to play as a regular platformer, the floaty jumping and movement controls cause it to become a lacking and unimpressive experience. The inclusion of a player created hero in the Sonic universe is a very interesting idea, but one that doesn't feel as polished as it could have been or as important as they initially had us believe. There are several good ideas here that show a glimmer of hope for a modern Sonic game in the future, but these ideas pale in comparison to those that don't quite measure up or come across as baffling design choices, but until then, Sonic Mania is by far the better Sonic experience and far cheaper as well. Sonic Forces WAS PURCHASED BY THE REVIEWER.